1. Clean carpets create a pleasant atmosphere for employees to work in. 2. Having carpets cleaned regularly helps remove pollutants and germs that can make employees sick and trigger allergies or asthma. A healthy, clean environment can improve the attendance of employees. 3. Hiring a professional company that uses eco-friendly cleaning solutions such as Heaven’s Best will ensure you do not make your staff sick. Some carpet cleaning companies that charge cut rate fees, use harmful cleaning agents and hazardous chemicals that pollute the air inside the office. These cleaning solvents can produce fumes and poisonous gases. If the employees working in your office happen to inhale them, they could develop various health problems such as headaches, sneezing, coughing, nausea and breathing troubles etc. Those with allergies or asthma could be adversely affected with even worse symptoms. So, it may not be the best option to call the cheapest carpet cleaner you can find. Heaven’s Best Carpet Cleaning is a Professional company with IICRC (Institution of Inspection Cleaning, & Restoration Certification) trained technicians. Along with a thoroughly trained staff who knows how to safely and correctly clean your carpets, we offer very competitive rates. We also use environmentally safe cleaning solutions that will thoroughly clean your carpets, but will not harm your staff, your customers, children or pets. 4. Hiring a reliable, professional carpet cleaning company, such as Heaven’s Best of Birmingham will ensure that you are maximizing the life span of your carpet investment. Cleaning carpets regularly will help to extend the life of one of your largest investments in an office. Don’t let just anyone clean your carpets! 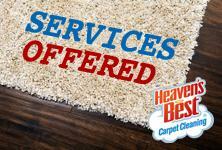 Call the professionals at Heaven’s Best at (205) 618-9150 for a FREE Analysis of your Carpet and a FREE ESTIMATE. For clean, healthy office carpets, employ all of these important reasons to have your carpets cleaned at your business in Birmingham, AL.